I have my friend Shervin to thank for originally posting this to his Facebook page. Like me, he has a hankering for the magnificent textiles of the past! A wall panel from Tipu Sultan's tent. Cotton chintz with a white ground, patterned with acanthus cusped niches, each enclosing a central vase with symmetrical flower arrangement, predominantly in reds and greens, the green achieved by over-painting dyed indigo with yellow (a fugative pigment which has partially disappeared). An enlarged version of the flower-head motif appears in the main horizontal borders on a green ground, and scaled down on a yellow ground in the spandrels of the arch. Triple vertical borders separate the panels, at each end of which is a metal eyelet that has been whipped with thick cotton thread. A black and white merlon and rosette band runs along the top of the qanats. The outside of the tent is a seperate layer of coarse white cotton. Later Mughal, c.1725-50. The Hermitage Museum collections include around three million pieces of world class treasures, of which only about a tenth are on display in the Museum complex in the Winter Palace. Among them are paintings, graphic works, sculptures and works of applied art, archaeological finds and numismatic material. The rest are stored in the Hermitage storage facilities. In this fascinating storage, we see architectural genius: the ability to beautifully both store (on a large scale) and display world treasures (in a high security environment). We see rows upon rows of great Masters in their glass fronted filing cabinets, sculptures from many genres and epochs, and the breathtaking icon collection. With only about one-tenth of the three million pieces on display at the museum, our exclusive behind-the-scenes visit allows you to see how the world-class collections are stored when not on display...The Hermitage Storage Facility at Staraya Derevnya is located nearby to the metro station of the same name. It is a large modern facility where the artwork and other items that are not on display in the museum proper are stored. The secure storage facility holds items never before displayed and also items too large to be shown in the Winter Palace, such as the Imperial carriage collection. These chambers hold a wealth of treasures. Visitors can see there a number of exciting exhibitions including tapestry collection, open storage of XVI—XIX centuries' furniture, a travelling tent of a Turkish sultan and others. OVAL TENT WITH TWO MASTS. Turkey, 1st half of the 17th c. Cotton, satin, gilt leather. Won at Vienna in 1683; in. 1728 it was taken to Dresden by August II. Bought from the Vettin collection and donated to Wawel by Szymon Szwarc in 1934. One of the most exquisite works of Turkish tent making.....anyone better photo ? !....Hali cited : The tent was captured at Vienna on 12 September 1683, when the Holy League army of Polish King John III Sobieski and that of the Holy Roman Emperor defeated the Turkish army commanded by Grand Vizier Kara Mustafa. In 1729 the tent was taken by Augustus (II) the Strong to Saxony to lend lustre to military exercises and great parades. It was donated to Wawel in 1934 by Szymon Szwarc. The roof and walls are decorated with arcades within which are medallions filled with intertwining floral patterns and flowers, including stylised carnations and tulips – the Otttomans’ favourite flower. Above the oval medallions are cartouches of gold satin with blessings written in Arabic script. The tent was originally supported on two poles, the sockets into which these go are reinforced with leather, and a system of pegs and ropes for pulling and stretching the fabric were used. The outer surface is covered in sturdy canvas, impregnated with copper compounds, which gives it its cool, pale green colour. 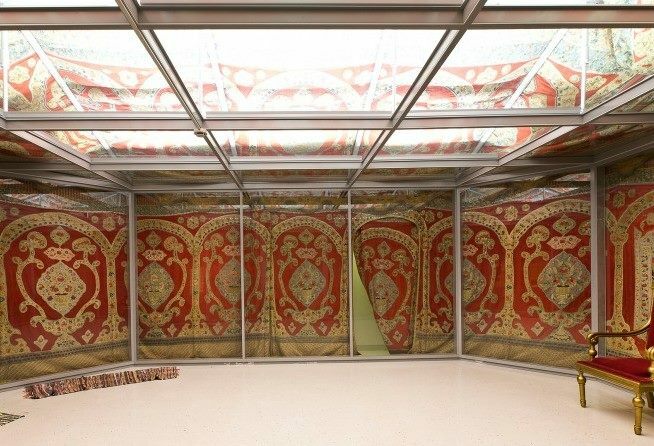 The tent underwent restoration from 1991 until 1999: all of the appliqué decoration was removed, the fabrics were cleaned in water baths and then re-applied. Today it is brilliant condition and helps recreate some of the splendour associated with the higher echelons of Ottoman society, even on military campaign. The tent was on show until 12 September 2013 at Wawel Royal Castle, Special Exhibition Rooms, 2nd Floor, enter via Senators’ Staircase.